Do you know where your drains flow and their exact locations? The answer for so many of us is of course, No! One of the major challenges with drains is that they are out of sight, which is convenient most of the time but becomes a problem when they become blocked, new pipework has to be connected or you need to have some work done on your property that involves excavation. Drawings of a property’s drainage system are so often inaccurate at the outset or have not been updated with changes and additions to the system made since the original build. Our drain tracing services can reveal the exact layout of your drains. Our equipment will identify the location of your drainage underground and the corresponding path above ground; this not only makes drain repairs as efficient as possible but will also help contractors working on your property avoid any costly mistakes through accidentally damaging your drains. The holy grail of drain tools for any man who has hand dug an eight foot deep hole only to find he has missed the pipe by three feet! 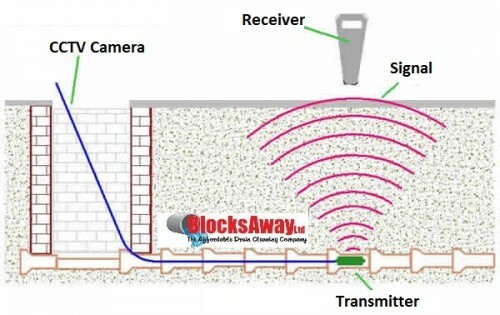 A transmitter is pushed down the system and the signal is tracked above ground with a receiver; it will tell you where and how deep it is, ideal for pin pointing defects found in camera surveys prior to excavation works, and for locating buried manhole chambers and septic tanks. If you would like your drains traced please contact us.